Following the recent expansion of Google Street View to most of the UK's roads, the Megalithic Portal has created a comprehensive map of prehistoric and ancient sites, all of which can be seen in Street View. "I realised we could use our web resource to pinpoint ancient stones, barrows and other sites on Google Street View", explains Andy Burnham, the founder of the Megalithic Portal. "I was soon hooked 'driving' up and down on the computer looking for ancient sites, so I launched a competition to see who could find the most sites." Andy's challenge has been taken up enthusiastically by amateur archaeologists up and down the UK. In just four weeks they have found over 1,000 ancient sites visible from the roadside, including 550 sites in England, and over 300 in Wales and Scotland put together. Amanda Gough from Cardiff is one of the volunteers, "This really gives you an idea of just how many ancient sites are still around and visible. Many people probably don't realise that they are driving or walking past ancient monuments on a regular basis. It's amazing to think that out there beside our busy roads is thousands of years of history just waiting to be discovered." 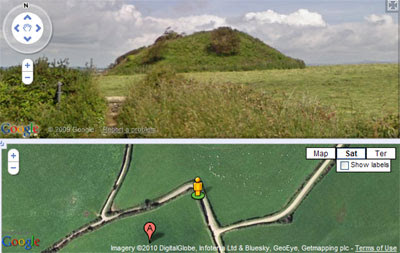 The Megalithic Portal has created a Google Map of the Street View discoveries. There are prehistoric sites to be found on Street View in the USA, and other parts of Europe", says Andy, "but the detailed coverage and clear images from the UK has made this by far the best hunting ground." The Megalithic Portal gives access to information about all types of ancient locations, including standing stones, prehistoric barrows, hill forts, ancient crosses and holy wells. Each page includes details of their condition and access, as well as inviting visitors to contribute their own photos and information to the growing resource. Through this it now has over 50,000 locations plotted and 55,000 images uploaded from all over the world. I had been working on my own collection of megalithic standing stones that can be viewed in Google Maps Street View. Having seen the awesome job that the Megalithic Portal have done I realise I will never be able to match their comprehensive coverage. Therefore I'll be giving up on this collection now - but for those who might be interested here's the small collection of Street View images that I had managed to gather so far.